This week’s column deals with solutions to common (and some less common) problems that use little-known features of iTunes or third-party software. The questions this time can only be solved with a workaround, or by using iTunes in a way it’s not intended. Q: I have some tracks on a CD that, when ripped with iTunes, have skips and clicks. I’ve tried ripping the disc on a different Mac, but I have the same issue. Is there any way I can fix this? It’s entirely possible that there’s a problem with the CD itself; you can test it by playing it on a standard CD player. If it plays correctly, then the CD is fine, and your computer is just having trouble ripping it. There’s an interesting workaround, though, that may get you clean audio files. It doesn’t always work, but I’ve found that it sometimes succeeds even when other apps can’t rip the files correctly. If you open a CD's window, you'll see the files that correspond to tracks. 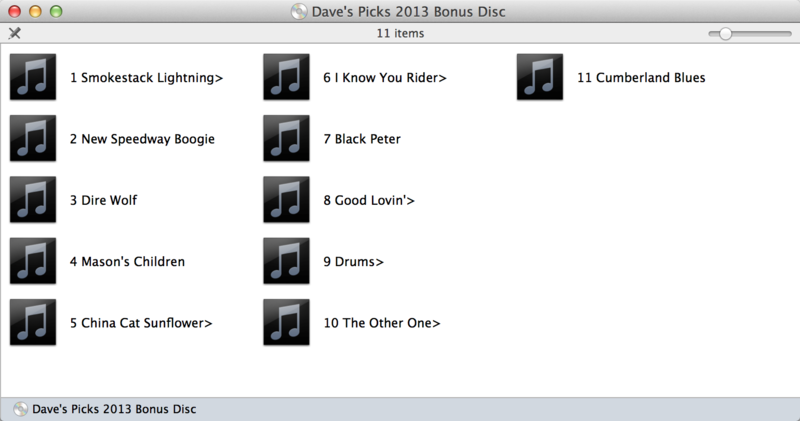 If iTunes is open, and has recognized the disc, you'll also see the names of the tracks on those files, as here. Insert the CD in your Mac’s drive, then double-click its icons in the Finder. You’ll see a number of icons for audio files, one per track. Drag the files (tracks) that won’t rip correctly to a folder on your desktop; this will create uncompressed AIFF files. 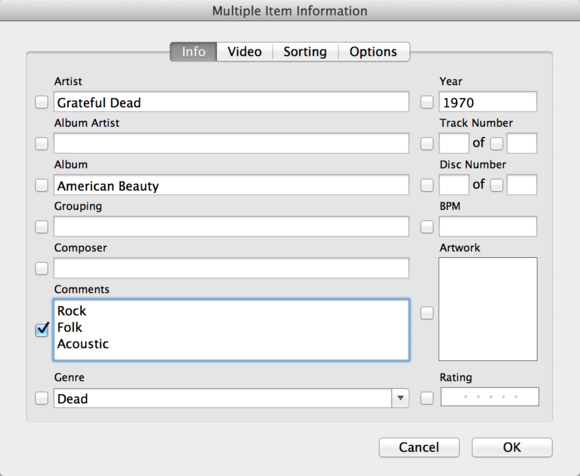 Next, create a new, empty playlist in iTunes, and drag the files to that playlist. Listen to them and see if they have the same errors; if not, you can go ahead and use them. You’ll need to tag the files—add the information for album, artist, and so on, and don’t forget the track numbers—then you can convert them using iTunes. Select the files, then right-click and choose Create file format Version, where file format is the import format you’ve selected in iTunes’ General preferences (by default, this is the iTunes Plus setting, which makes 256-kbps AAC files). When the conversion is done, delete the AIFF files. Q: I would like to be able to filter songs by genre, but many songs could fit in multiple genres (pop, rock, 1960’s rock, and so on). Is there a way to assign more than one genre to a particular song? Unfortunately no, and I really think that iTunes should offer both genres and subgenres. There are two workarounds I can suggest here, however. The first involves creating your own genres that contain subgenres. If you type a genre name in the Genre field, iTunes will create it if it doesn’t already exist. So, instead of Rock, you could create genres like Rock - 1960s, Rock - Folk, and Rock - Pop. However, this still limits you to a single genre in that field. You could get more granular by creating genres such as Rock - Pop - 1960s, but that might be a bit much. I know many people who use this approach for classical music, creating genres such as Classical - Symphonic, or Classical - Opera, but this method may not necessarily suit your needs. Enter any text you want in the Comments field. Tip: press Option-Return to move to a new line (pressing Return actives the OK button). The second workaround uses the Comments tag. You can enter any text you wish in this tag, such as the name of a secondary genre. You can then create smart playlists looking for keywords in this field. To do so, select one or more songs, then press Command-I. Click Info, enter your text in the Comments field, then click OK. Note that if you already have text in that field, entering text in this way will overwrite the existing text, and you’ll need to edit each song individually if the songs have different comments. Then you can create smart playlists that look at the text in the Comment field and combine them in whatever ways you want. Q: I have several cases where an artist has released more than one album with the same name, such as the band Tindersticks, who released self-titled albums in 1993 and 1995. 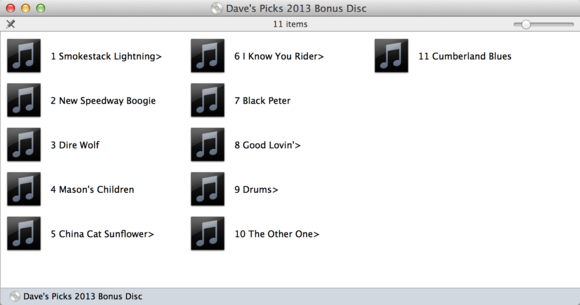 Is there any way to stop iTunes from merging these two albums into one without lying in the album tag? You’d think iTunes would take the year tag into consideration, but no. Alas, no. The only workaround here is to cheat in the album tag. For example, I have three albums by Peter Gabriel, each named Peter Gabriel. In the album tags, I put Peter Gabriel 1 (aka Car), Peter Gabriel 2 (aka Scratch), and Peter Gabriel 3 (aka Melt). Q: I have lots of audiobooks that I’ve ripped from CDs, and I’d like to have them in the cloud, using iTunes Match, but iTunes tells me they can’t be uploaded. Is there any way I can do this? Is this because iTunes can’t match them, since they’re not songs? There are two reasons why iTunes Match might not work your ripped audiobooks. First, if you’ve set their Media Kind to something other than Music, iTunes Match will ignore them. Second, iTunes Match only accepts files that are 96 kbps or higher. If you’re like me, you’ve probably ripped most of your spoken word CDs at a lower bit rate. I have a set of Shakespeare plays on CD that I wanted to be able to put in the cloud. I use the technique that I describe in this article. I was able to upload all of them, and I can now access them using iTunes Match. You can put audiobooks in the cloud with iTunes Match, if you use a workaround. One tip: if you have lots of audiobooks made up of multiple, short files, you’re better off joining the tracks at least to one file per CD. Since iTunes Match has a limit of 25,000 tracks, you may use up a large part of that number with audiobook files. My Shakespeare set comprises 811 files for the 37 plays; if I ripped them as one file per CD, I’d have fewer than 100 files.